Over 30 years of offering outstanding home gym innovations, HOIST® has perfected multi-station gym systems where several people can complete the most common health club exercises. 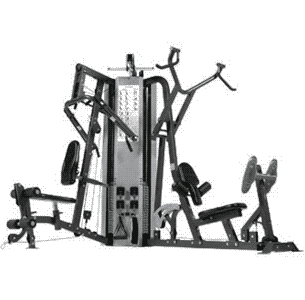 The Hoist Multi-Stack Gym – H-2200 2 provides a wide range of health club exercises. Its “L” shaped design saves space and easily allows two users to exercise simultaneously. All body sizes can use this home gym because of its easy adjustment capabilities. The straps and exercise bars are always accessible because of a convenient attachment rack. It features a fixed pressing arm or an articulating arm. This home gym is extremely durable because of Easy-Glide inserts that protect the metal from wear.